LEOPARD syndrome More Details (LS) is a rare genetic disorder with significant cardiac abnormalities, progressive hypertrophic cardiomyopathy (HCM) being the most common. The acronym LEOPARD stands for the following: L, lentigines; E, electrocardiographic conduction abnormalities; O, ocular hypertelorism; P, pulmonary stenosis; A, abnormal genitalia; R, retardation of growth; and D, deafness (sensorineural). About 200 patients have been reported worldwide till date. This is a report of an infant with LS, rapidly progressive HCM, and an unusual mutation in exon 13 of the PTPN11 gene. 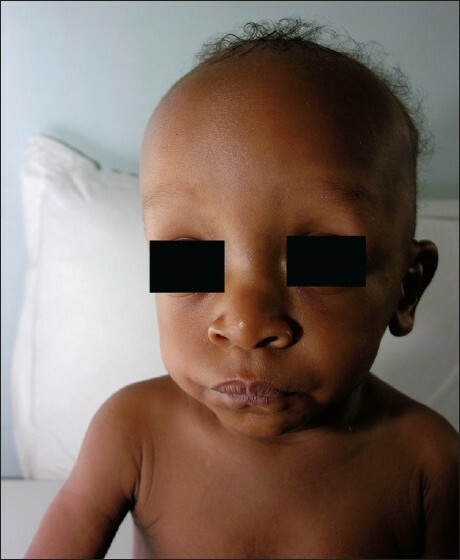 An 11-month-old African male infant presented with failure to thrive (weight 5.8 kg, below third centile) and a murmur. After an uneventful antenatal period including normal ultrasound scans, he was born at term by vaginal delivery (birth weight 2.9 kg; length 50 cm). There was no family history of congenital heart disease but his father had multiple cafι au lait spots. The child showed moderate hypotonia and mild motor development delay but social milestones were normal. Examination revealed dysmorphic features including hypertelorism, low-set ears, depressed nasal bridge, lax joints, rocker bottom feet, and multiple cafι au lait spots on the trunk [Figure 1]. Genitalia were normal. There was a grade 3/6, loud, harsh systolic ejection murmur at the left sternal border. Chest X-ray showed cardiomegaly. Electrocardiogram showed biventricular hypertrophy. 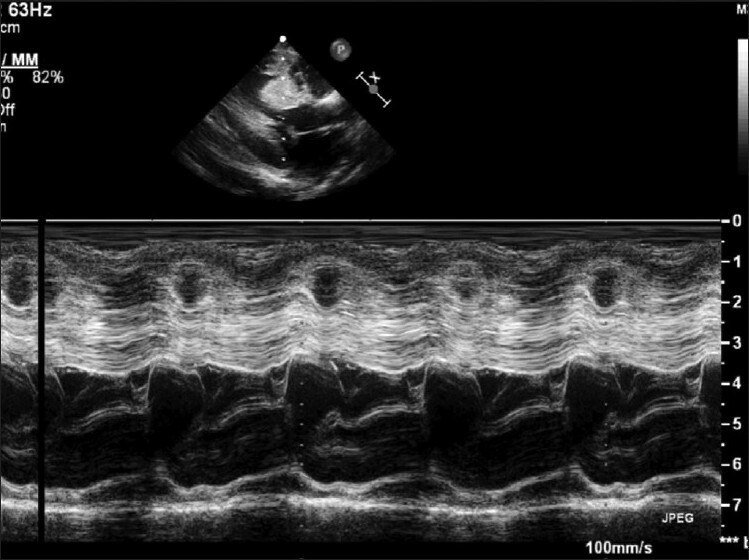 Echocardiography revealed features of HCM with severe left ventricular outflow obstruction (a peak systolic gradient of 100 mmHg) [Figure 2]. Visual and auditory brainstem response testing was normal. Conventional G-banded chromosome analysis showed a normal karyotype. On further evaluation, all 15 exons and their flanking introns of the PTPN11 gene were amplified by polymerase chain reaction (PCR) using the speciﬁc primers and screened by liquid chromatography. When the variant elution proﬁle was detected, bidirectional direct sequencing of the corresponding PCR products was performed. No mutations were detected on exons 3 and 8 of the PTPN11 gene. An abnormal elution proﬁle on liquid chromatography was found in exon 13. Bidirectional direct sequencing revealed a cytosine-to-guanine transition at position 1528(C1528G) in exon13, predicting the substitution of glutamine with glutamate within the protein tyrosine phosphatase (PTP) domain consistent with LS. The child was started on beta blocker therapy, and the parents were explained the need for regular monitoring and possibly surgical intervention for HCM. LS is a rare "neuro-cardio-facial-cutaneous" genetic syndrome similar to the Noonan syndrome (NS). Growth retardation is seen in less than half the cases, mild mental retardation in one-third, and sensorineural deafness in one-fifth. Cryptorchidism, hypospadias, urinary tract defects, and ovarian abnormalities are observed infrequently. Cardiac abnormalities are seen in 85% of cases of LS (comprising HCM 70%, pulmonary stenosis 25%, conduction defects 23%, and aortic/mitral valve abnormalities in isolated cases). HCM is associated with the risk of arrhythmias and sudden death. Hence, it should be excluded in any patients with pigmentary abnormalities, systolic murmur, and electrocardiographic abnormalities. Intriguing reports have emerged highlighting the relationship between site-specific mutations of the PTPN11 gene and specific cardiac lesions, especially rapidly progressive HCM. HCM occurs in about 57% of LS patients with PTPN11 mutation. LS patients without PTPN11 mutations have a higher prevalence of left ventricular hypertrophy, sudden death, left atrial enlargement, and bradyarrhythmias. An association between mutations in exons 7 and 12 and HCM, and between mutations in exon 8 and pulmonary stenosis (PS) has been observed. Faienza et al. reported a newborn with NS phenotype and Gln510Glu mutation of the PTPN11 gene that had lethal progressive HCM. The rather early onset of severe HCM in the present patient may be linked to the presence of mutation in exon 13 of the PTPN11 gene. LS is often underdiagnosed as many of its features are mild. The criteria proposed by Voron et al. for the diagnosis of LS include the presence of lentigines. However, lentigines appear only by 4-5 years and then tend to increase around puberty. LS would be missed in infancy - where it is crucial to make the diagnosis and prognosticate - if one were to rely heavily on the presence of lentigines. Cafι au lait spots, seen in 70-80% of cases, precede the appearance of lentigines. Pectus carinatum, facial abnormalities including hypertelorism, ocular ptosis and small low-set ears are the other skeletal features described. In general, the long-term prognosis of LS patients is favorable. Patients with cardiac anomalies need periodic assessment. Mild pulmonary stenosis has a good prognosis, while valvulotomy is indicated for severe valvular dysplasia of the pulmonary valve. As suggested by Limongelli et al., pathologic and clinical findings may be similar in familial HCM and left ventricular hypertrophy associated to LS. Accordingly, LS patients with ventricular hypertrophy may follow familial HCM algorithms. A beta-blockade or calcium channel blocker therapy is indicated in the presence of a significant left ventricular obstruction. The surgical resection of the left ventricular outflow tract is indicated in more severe cases or if there is no significant improvement with medical therapy. Isolated conduction defects should be monitored annually and treated as in the general population. This case highlights the problems in identifying LS in infancy, when diagnosis needs to be made from features other than lentigines, supported by molecular genetic evaluation. Cardiac disease in LS can be progressive, especially when there is documented mutation in exon 13 of the PTPN11 gene. The rather severe form of HCM noted in the present patient is consistent with the genotype-phenotype correlation of mutation in exon 13 of the PTPN11 gene currently being recognized. 1. Sarkozy A, Digilio M, Dallapiccola B. Leopard Syndrome. Orphanet J Rare Dis 2008;3:13. 2. Legius E, Schrander-Stumpel C, Schollen E, Pulles-Heintzberger C, Gewillig M, Fryns JP. PTPN11 mutations in LEOPARD syndrome. J Med Genet 2002;39:571-4. 3. Limongelli G, Sarkozy A, Pacileo G, Calabrò P, Digilio MC, Maddaloni V, et al. Genotype-phenotype analysis and natural history of left ventricular hypertrophy in LEOPARD syndrome. Am J Med Genet Part A 2008;146:620-8. 4. Limongelli G, Pacileo G, Marino B, Digilio MC, Sarkozy A, Elliott P, et al. Prevalence and clinical significance of cardiovascular abnormalities in patients with the LEOPARD syndrome. Am J Cardiol 2007;100:736-41. 5. Sarkozy A, Conti E, Seripa D, Digilio MC, Grifone N, Tandoi C, et al. Correlation between PTPN11 gene mutations and congenital heart defects in Noonan and LEOPARD syndromes. J Med Genet 2003; 40: 704-708. 6. Faienza MF, Giordani L, Ferraris M, Bona G, Cavallo L. PTPN11 gene mutation and severe neonatal hypertrophic cardiomyopathy: What is the link? Pediatr Cardiol 2009;30:1012-5. 7. Voron DA, Hartfield HH, Kalkhoff MD. Multiple lentigines syndrome. Case report and review of the literature. Am J Med 1976;60:447-56. 8. Coppin BD, Temple IK. Multiple lentigines syndrome (LEOPARD syndrome or progressive cardiomyopathic lentiginosis). J Med Genet 1997;34:582-6. 9. Digilio C, Sarkozy A, Pacileo G, Limongelli G, Marino B, Dallapiccola B. PTPN11 gene mutations: Linking the Gln510Glu mutation to the "LEOPARD syndrome phenotype". Eur J Pediatr 2006;165:803-5.